To celebrate Gaja wine’s debut and collaboration with Luxury Collection Resort, The Andaman Langkawi, the fifth generation successor Giovanni Gaja hosted a wine dinner and initiated us to his family’s rich heritage. A profusion of wine dinner menus all over the city has dimmed the spark of the once luxurious date night activity, driving gourmands and courting pairs out to greener pastures. We too are on a quest for novelty wine experiences, that led us to the blue shores of the Luxury Collection Resort, The Andaman Langkawi. The island resort has struck up a collaboration with Gaja wine, Italy’s influential winery, now available as a unique epicurean experience offered quarterly. The Andaman is the first resort in Langkawi to carry Gaja wines on its wine menu, to pair with the famed gourmet specialties of the hotel's talented chefs. 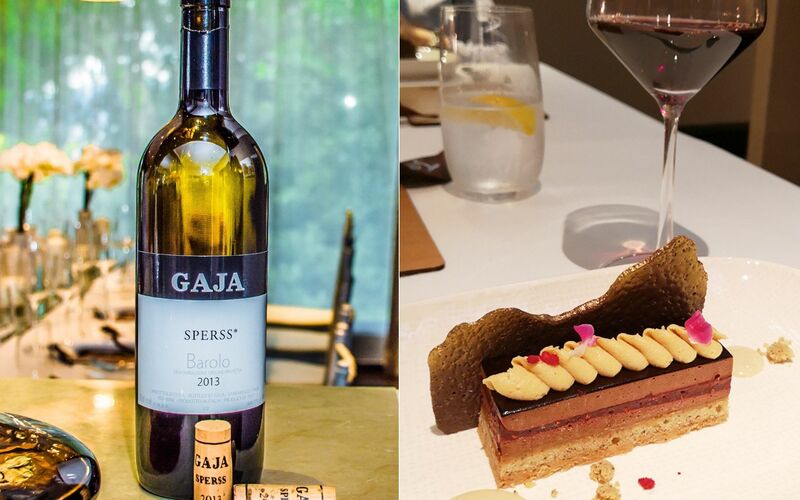 Fortunately for us, we were one of the first on the island to partake of a private dinner party featuring 4 of the legendary Gaja wines and an authentic Italian menu curated by Italian native, executive chef Stefano Micocci. The dinner venue—the presidential suite—was turned into a cosy abode for our intimate party hosted by the bright-eyed fifth-generation family member, Giovanni Gaja. No sooner had we took our seats at the candle-lit table, Giovanni initiated us his family story that went back to 1859. The Gaja family, who own vineyards in Piedmont essentially put the region on the world map, as pioneers of modernist practices: think single vineyards and sophistications like green harvesting, higher density planting, and know-how of an encologist. Our first wine of the evening, a 2016 Rossj-Bass, was served alongside an antipasto of semi-cured langoustine and local burrata cream, on a domed puffed pastry. “Rossj Bass is a wine dedicated to my sister Rosanna, and ‘Bass’ means low as it was produced at the bottom part of the Barbaresco village,” Giovanni explained. Glass to our lips reveal a burst of floral, fresh notes. There were also juicy tinges of apple and pear that rounded off in a mineral tang. It was paired to complement the dish’s fresh succulence and creamy richness, and enhanced the textures of caviar, crispy Français artichokes and cucumber water. The white wine is made from 95% Chardonnay and a touch of Sauvignon Blanc, we were told, remains to be one of the best of its kind. The primo was served with Gaja’s flagship wine, the Barbaresco, which the family has produced for over 150 years. To talk about the Barbaresco is to recall Gaja’s history, but we’re in rush, as we twirled and savoured luscious, fresh-made thin egg pasta, topped with thick white truffle shavings. Each strand was coated in noisette butter and the earthiness or porcini puree, and just the right amount of indulgence. Barbaresco is 100% Nebbiolo grapes gathered from 14 different plots. A wine collector once likened the blend to “being kicked in the face by a ballerina—discreet and elegant, yet austere at the same time.” Giovanni conceded that the Nebbiolo blend is a very stubborn variety. “It needs to be spoiled. The more interaction, the more slowly it starts opening up.” Our noses detected a vibrant fruitness of this 2014 wine, followed by a harmonious palate of coarse and smooth; think chewy and acidic bites, followed by a cascade of forest fruit, plum, licorice and coffee. Next was a seafood course, and glasses were filled with the wine known as Promis. Artfully presented tuna belly barbeque was set down, served with roasted red chilli, black olive pesto and a drizzle of smoked eggplant sauce, playing briny, complex sidekicks to the firm white fish. As its name insinuates, Promis is one of the best vintages: the Merlot hails from one of the best plots of land from the Ca’Mercanda estate in Bolgheri. The elegance of this 2015 vintage owes its taste to a blend of 55% Merlot, 35% Syrah and 10% Sangiovese. ‘Ca’ is short for house, and ‘Mercana’ is market, which translates to the house of endless negotiations," Giovanni explained. “It took my father 1 year and a total of 90 meetings to convince them to sell him the land,” he recalled, as we savoured the floral wine's rose, blackberry and earthy root notes. Our mains ended with braised wagyu beef cheek, paired with a 2013 Sperss wine. Before digging into the tender cut of meat, we inhaled the red wine and its aromas of tar, licorice and truffles. Made of Nebbiolo grapes, its symbolic status comes with a backstory as the first vintage that marked Gaja’s switch back to single vineyards status in 2013. Translated from the Piedmontese term for 'nostalgia', the aptly-christened Sperss boasts a full-bodied profile of berries, currants and blood orange, a constrast to its earthy scent. Its lively flavour cut through the beefy juices and accompanying creaminess of gold saffron risotto. The Sperss tide us through a decadent dessert of nocciole e lamponi, a delicately layered chocolate opera slice of cream, dark cacao, and sponge, elegantly versatile, subtly basking in Giovanni’s beaming pride. As we capped with another round of the Sperss, contentment hung in the air. Bellies were indulged but not as full as our spirits, which were stirred by the richness of Italy's great family of wine producers. Gaja Wine is the first resort in Langkawi to carry the finest pedigree of Italian wine. The Andaman will also offer quarterly wine dinners paired with premium wines throughout 2019. Discover more on theandamanlangkawi.com or through Facebook.